Saying there’s been a reversal in the rivalry between the Sounders and Los Angeles Galaxy is likely going a step too far. Some have long insisted it isn’t much of a rivalry at all: With the Galaxy winning three of four playoff matchups, going to four MLS Cup finals and winning three titles since the Sounders entered the league in 2009. Still, there’s been a subtle shift in the lopsidedness since 2015, when the Sounders eliminated the Galaxy in the playoff knockout-round stage, then went on to a championship and additional finals appearance the next two years. Now, with the marquee franchises squaring off Saturday at CenturyLink Field, separated by only a handful of points in the standings, this might be the most equal footing the “rivalry” has ever been on. Indeed, the Galaxy had cruised far out in front of the Sounders most of the season. But five consecutive victories by the Sounders and an eight-game unbeaten streak has closed them to five points of the fourth-place Galaxy with two games in-hand. The Galaxy played to a 2-2 draw against Colorado on Tuesday. It has won just one of its past five matches and won’t have the dangerous Zlatan Ibrahimovic available Saturday. The Swedish forward did not travel to Seattle after hinting this week he’d skip the contest to avoid playing on artificial turf and risk re-injuring his surgically repaired knee. That appears to give the healthy Sounders an enormous leg up in the first of two matches in the next month against a team they’re trying to overtake. But emotions being what they are between these teams – the Galaxy a flagship MLS franchise with the Sounders constantly striving to emulate its success – the lineups on paper don’t mean much. A year ago, the floundering Galaxy was in disarray when it hired former Sounders coach Sigi Schmid a few days before the teams met in late July. That match at StubHub Center was a highly-charged and chippy affair that ended in a scoreless draw. Six weeks later, at CenturyLink Field, the Galaxy led 1-0 in the 85thminute before Lamar Neagle scored to salvage a draw for the Sounders. Both of those ties came in the midst of a club record 13-game unbeaten streak for the Sounders while the Galaxy was fighting to avoid the conference basement. So, indeed, a match featuring Schmid on one side coaching against former assistant Brian Schmetzer makes it unlikely the visitors will just roll over. The Schmetzer-Schmid showdown – with both teams again playoff contenders – has revived some of the old spark from earlier in the decade when Schmid coached the Sounders and Bruce Arena manned the Galaxy bench. Schmetzer said this game has the feeling of some of the earlier Sounders-Galaxy clashes this decade. 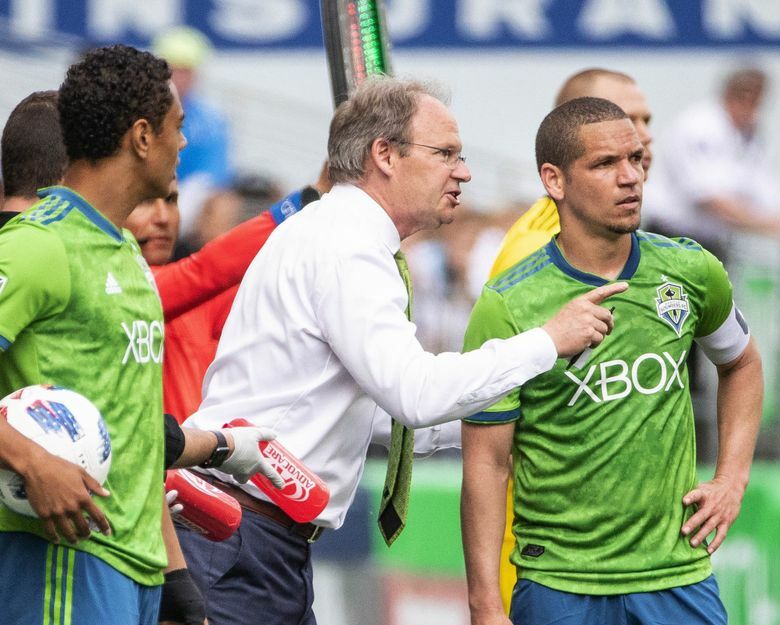 The torment for the Sounders reached a high point in 2014 when, having beaten the Galaxy for the Supporters Shield crown the final day of the regular season, they lost to Los Angeles in the conference finals. “The Galaxy used to have our number a little bit when they were winning a couple of championships in the (David) Beckham era,’’ Schmetzer said. “Those were some big games that we used to play. The dynamic between Bruce (Arena) and Sig (Schmid), there are a lot of similarities. And no matter what happens Saturday, the fate of the rivalry, derby, series, or whatever anyone wants to call it won’t hang on its result. These are two teams, after all, that measure success in terms of eliminating one another and ultimately winning championships. The Sounders still have a ways to go on both fronts. But by taking care of business this weekend, they’ll at least better position themselves to narrow the series ledger come November.